Warp speed, sir, and bring me my Bat'Leth - the most honorable weapon! This massive 48 in. alien weapon is straight out of your favorite sci-fi series and movie. It doesn't get any more realistic than this with the all-stainless construction and padded wrapped grips. It isn't factory sharpened, but can be brought to an edge. I have had mine for about six years and it is an awesome weapon to hold, the balance on it is pretty good. 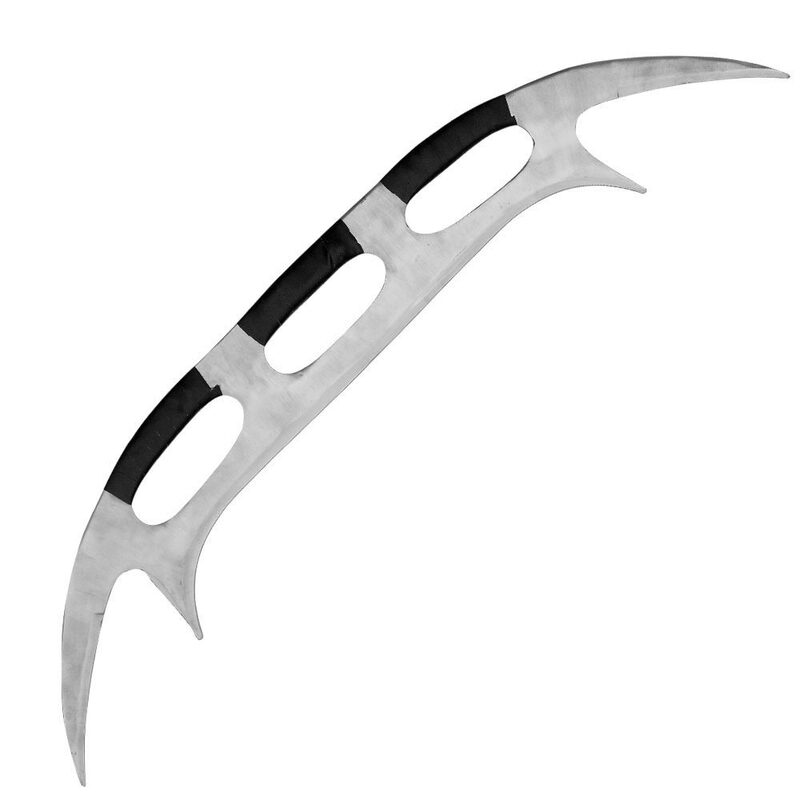 I study Martial Arts and this is very useful when you practice staff forms... you may have to modify the form a little but this weapon will add some flare to the form or you could develop your own form or Kata with this Bat'leth. Check out Bat'leth forms on YouTube. The only draw back I can tell about is the wrapping material is not that good: some hockey grip tape will do the trick. 5 star all the way. I have a first edition. It sharpened to the point I am careful about who I let handle it. I made covers for the tips and edges. I hang it high just 2 inches from the ceiling. For combat, my rifle bayonet training seems a good fit. A rifle without ammo has a lot less edge and 3 points less to be stabbed and ripped open with. I removed hand grip wrapping. Fashioned 2 piece wood grips contact cemented them in place and rewrapped with the original material. Sure leather would be cooler but the look is great. 5 star all the way! Its a great replica! No, its not sharp. The handles are good, and its got weight to it. So you know its not flimsy or cheap. Its great for the price. Got it for my dad for Christmas and he was speechless! He showed it off to his treky buddies and they loved it and were jealous. It IS big, and unlike some people who dont understand, you get what you paid for. I recommend buying it. True Swords up until now has not misled me. That changed with this weapon. This Bat'Leth is very thin, not massive at all. It was bent, and almost impossible to put an edge on. I would not recommend this to anyone that wants a "Bat'Leth" . True Swords should upgrade to a Bat'Leth that is .25 inches, and made of 1045 HC Steel. People like me would be willing to pay for such a weapon. This thing is freaking awesome! I'd upload a picture if that was an option because the one shown doesn't do this thing justice. The blade isn't too sharp but it can be sharpened if you want to do that. The bindings are nice and tight and don't look like they are gonna come off or unravel (which was a complaint I saw for the bat'leth on other sites). I bought this as a Christmas gift but now I'm not sure I want to give it up! Nice for the money but needs improving. The handle wrap is like some sort of cheap bike handlebar wrap needs to be leather which I'm going to go get at the craft store. I guess the Klingon in me wants to customize it anyway. and could use to be a 1/8 - 3/16 thicker and partially sharp Then you could get a better price for them 60 - 80 and if you were so inclined a sheath or a back rack clip would rock. Awesome! Better than I expected for the price. This will make the perfect addition to the Klingon costume I'm planning for this year. The quality of the metal is great, but the handles are not evenly cut out. Like I said though, for the price, this is a great buy. Great quality. Surprising heavy but well balanced. I would order it again. Handles are just some crappy fabric tape. it just kind of folds over at the ends. Blade edge is also not straight or smooth. Overall, it a cool product with a lot of "wow" factor. But the quality is not typical of what i normally see from trueswords.com.